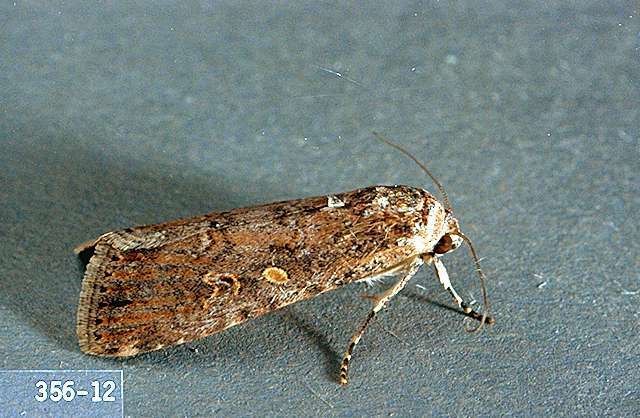 Pest description and crop damage Beet armyworm moths have a wingspan no larger than 1.25 inches and are mottled gray and brown, with irregular banding and a light-color, bean-shaped spot. Eggs are pale green to pink, ridged, and deposited in a mass which is covered with a white cottony material. 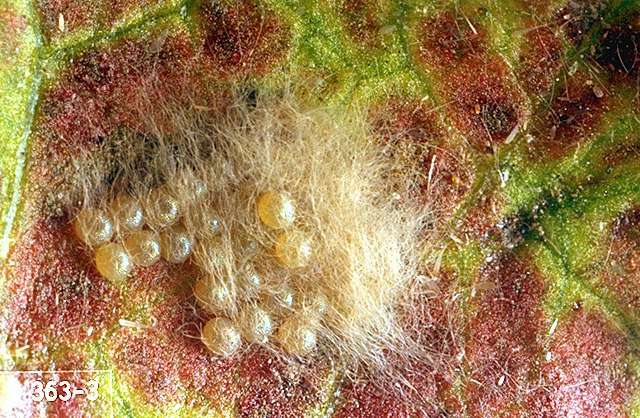 The tiny, newly hatched larvae feed in colonies. 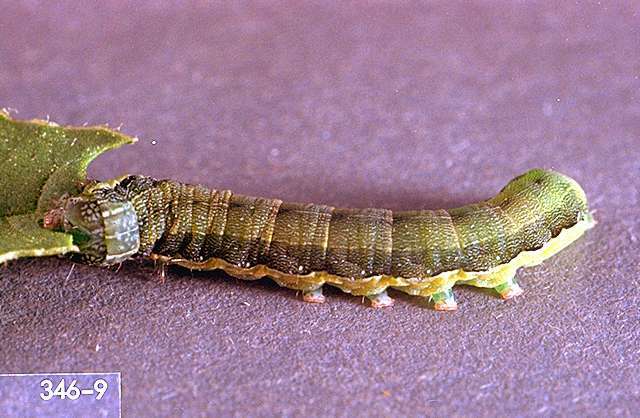 The larvae are about 1.25 inches long when full grown and are mottled olive green to almost black. Armyworm larvae feed in colonies shortly after hatching and skeletonize leaves. As they grow larger, they tend to disperse and consume irregular patches of foliage or entire leaves. Bacillus thuringiensis (Javelin) at 0.12 to 1.5 lb/a. PHI 0 days. REI 4 hr. Armyworms only. Add an appropriate spreader-sticker to enhance control. Most effective on small larvae. Some formulations are OMRI-listed for organic use. beta-cyfluthrin (Baythroid XL) at 0.019 to 0.025 lb ai/a. PHI 0 days. REI 12 hr. Retreatment interval 7 days. Do not exceed 0.1 lb ai/a per season. First and second armyworm instars. indoxacarb (Avaunt) at 0.065 to 0.11 lb ai/a. PHI 3 days. REI 12 hr. Do not exceed 0.44 lb ai/a per crop. Retreatment interval 3 days. methomyl (Lannate SP) at 0.45 to 0.9 lb ai. PHI 10 days. REI 48 hr. Do not exceed 4.5 lb ai/a per season. Limit 8 treatments per year. methoxyfenozide (Intrepid 2F) at 0.06 to 0.12 lb ai/a for early season or at 0.12 to 0.16 ai/a for mid to late season. REI 4 hr. PHI 1 day. Do not exceed 1 lb ai/a per season. permethrin (Loveland Permethrin) at 0.1 to 0.2 lb ai/a. PHI 1 day. REI 12 hr. Do not graze or feed. Retreatment interval 3 days. Do not exceed 0.2 lb ai/a per season. spinetoram (Radiant SC) at 0.039 to 0.078 lb ai/a. PHI 1 day. REI 4 hr. Retreatment interval 4 days. Do not exceed 0.266 lb ai/a per season. Limit 6 treatments per year. Do not apply to seedling leafy vegetables grown for transplant within a greenhouse, shade house, or field plot. spinosad (Success, Entrust SC) at 0.06 to 0.125 lb ai/a. PHI 1 day. REI 4 hr. Do not exceed six applications or 0.45 lb ai/a per crop. Entrust SC is OMRI-listed for organic use. thiamethoxam/chlorantraniliprole (Durivo) at 0.195 to 0.257 lb ai/a, soil application. PHI 30 days. REI 12 hr. Do not exceed 0.172 lb ai of thiamethoxam or 0.2 lb ai of chlorantraniliprole per acre per growing season.